Harvesting and making process explained. A standard pick is one bud with 3 or 4 leaves when the buds at the top of a bush reach half the size of a mature leaf. Harvesting can take place three times a year in spring, summer and autumn. 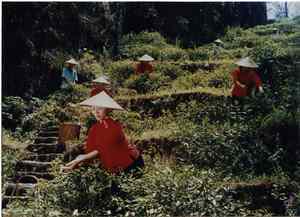 But high grade tea grown in the "Middle of the Mountain" is only harvested once a year in spring. Freshly picked leaves are left in the sun to dry from 0.5 to 2 hours to remove moisture then moved indoors to cool.